Positively Punk Rock: Talking With Patrick Walsh of Positive Force D.C.
Hopeful ideology and punk rock aren’t always lumped together, but down in D.C. cynicism seems unable to thrive, in part thanks to Positive Force D.C. The organization has presided in the district since the mid 1980s and for the past three decades, it has organized flea markets, book clubs, and hundreds of benefit concerts for local and national causes, fronted by bands like Fugazi and Bikini Kill. I recently traded emails with Patrick Walsh, a New York transplant who became an active member of Positive Force on his arrival to D.C., about Positive Force’s current state, their democratic process, and Walsh’s experience organizing the Positive Force benefit extravaganza this past Saturday. Positive Force DC has been around for over two decades. Although it has always been a presence, there have been periods of stagnation. Where would you categorize Positive Force at the moment? I think we’re definitely in a strong upswing. Our ranks are growing. We’re working to build St. Stephen’s, (the home base for Positive Force meetings/shows), into a great space for great events. Everyone is invited to join and bring whatever ideas they have. It’s a great, varied group of interesting, earnest kids. Positive Force does a ton of free and sponsored functions around town, such as film screenings, punk rock flea markets, and benefit concerts. How do you guys go about deciding what events to do? Is it a group decision or do few main people oversee the more regular events? Anyone can propose and plan anything they want at St. Stephen’s and if we agree that it sounds like a good event (all ages, no alcohol, no hateful attitudes, etc. ), we want to help make it happen. We have a core “space use committee” who agree that it sounds good and agree to be there, but seriously anyone with ideas can just e-mail dcpositiveforce@gmail.com with the idea, or better yet, come to our meeting and get involved. 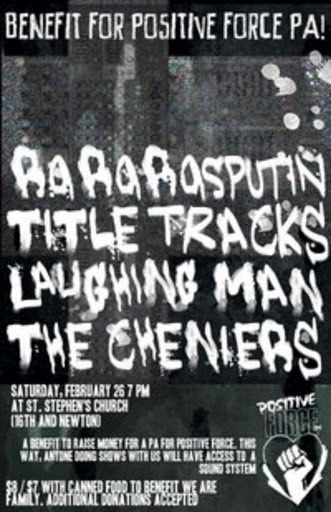 This event (the benefit concert to raise money for St. Stephan’s to procure a PA system) specifically came out of a lunch I was having with Patrick Kigongo from Ra Ra Rasputin (one of the four bands that played), but the upcoming Screaming Females and Dropdead shows, for example, were set up by another member. The punk rock flea market is a group effort. How did you personally get involved in Positive Force? I went to the Titus Andronicus show last year and had an amazing time, so I signed up for the mailing list. At the time, I barely knew anyone in the area, I was just starting to make my first D.C. friends, and so I was just looking to meet some people. Thought about going to meetings, but was a little nervous until I befriended a couple members at Fort Reno last summer and they encouraged me to come. How did the four local bands playing get involved with the benefit? They all have a bit of a different sound (garage, pop-punk, dance, folky, etc.). Although there was a quick moment of panic shortly before the show thanks to a small rumor that The D.C. Square Dancing Collective’s Appalachian Square Dance was also using St. Stephan’s auditorium, (turns out the hoedown was actually in the church’s sanctum) the concert went off without a hitch and brought Positive Force one half closer to the joys of PA ownerships. Who said youth culture was dead?